Magnacharger 2008 Hummer H3 Alpha Silver Finish [01-12-60-109-SL] : Supercharger Superstore, Your Online Source for Vortech Superchargers, Paxton Superchargers, Procharger Superchargers, Magnacharger Superchargers and Techco Superchargers! Front inlet 5th Gen supercharger with integral bypass valve. 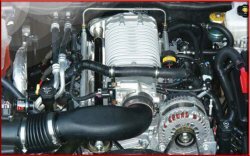 Patented cast aluminum manifold replaces factory composite unit and features equal-length intake runners that produce high torque and improved isolation from radiant heat. The best feature of all is the latest in proprietary intercooler airflow technology (patent pending). Computer programmer re-flashes factory ECU, spark and fuel calibration, transmission shift points, line pressure and torque converter strategies are optimized to manage increased torque, horsepower and mileage.